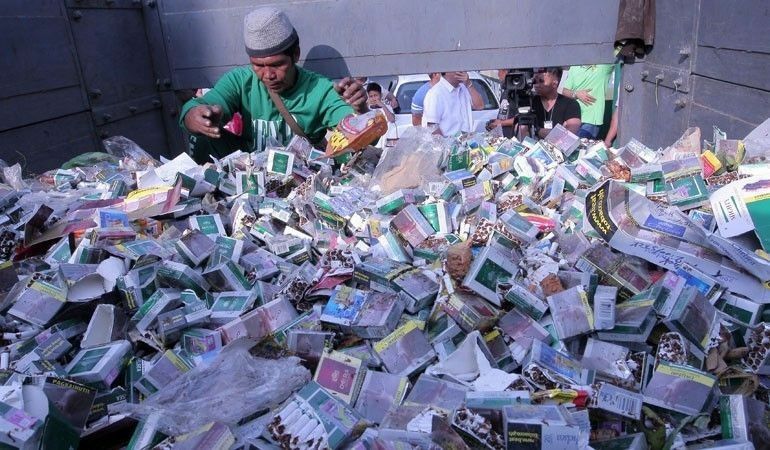 MANILA, Philippines — The Bureau of Internal Revenue (BIR) yesterday smashed various illegally operated cigarette-making equipment and fake cigarettes to show the government’s commitment to fight tobacco smuggling and counterfeiting. According to the Department of Finance (DOF), the destroyed contraband include three filter maker machines, two packaging machines, a cigarette-making machine, 484 master cases of various cigarette brands, as well as raw materials such as filter rods, tipping papers, packaging foil, acetate tow and other supplies. These equipment and supplies were earlier seized by the BIR in illegally operating cigarette factories in Pampanga and Pangasinan. The DOF said the machines were bulldozed into pieces, while a grinder destroyed the cigarettes. “The destruction of these confiscated contraband will send a clear two-pronged message: Illicit manufacturing will not be tolerated. Tax evasion will be hounded ceaselessly,” Finance Secretary Carlos Dominguez said in a speech during the event in Porac, Pampanga. According to Dominguez, a single cigarette-making machine is capable of producing 20,000 sticks per minute, which is equivalent to about 9.6 million sticks during an eight-hour shift or 480,000 packs per day. By destroying these machines, he said the government has “effectively blocked attempts of being defrauded of as much as P16.8 million per day” which can be used for human capital development and the Build Build Build program. He said this ensures that the health and fiscal benefits of the sin tax reform law would be felt by Filipinos. “We are aware that with the increase in sin taxes, there will be greater incentive for evasion. This is the reason we have heightened our vigilance against the manufacturing and trade of illicit cigarettes,” the finance chief said. For one, he said the BIR has formed a strike team which is tasked to run after illicit manufacturers and traders. The BOC, for its part, has improved its capability, along with the Coast Guard, to effectively patrol the country’s trade routes and intercept the smugglers. “I promise you that your revenue-generating agencies will be unyielding in their efforts to thwart illicit manufacturing and tax evasion,” Dominguez said.